Last week my column on San Jose’s top five prospects took a look at the top five overall in terms of talent, production and investment made by the organization. While I’m of the opinion that a prospect like Rourke Chartier could be a dark horse during training camp, he is far from likely to make his NHL debut this season. The following five prospects are much closer to making their debuts. Depending on who you talk to, fellow defense prospect Patrick McNally might be more highly thought of within the organization than Joakim Ryan, but the latter’s skating ability is what impresses me most. While he doesn’t feature the same high-end speed and offensive skills, Ryan’s fluid stride reminds me a lot of another undersized defenseman in Brian Campbell. At the prospects scrimmage in July and the recent rookie game at the SAP Center, Ryan showed poise with the puck. His skating ability allows him to escape traffic on his own when there is no outlet pass available. The 22-year old just finished his collegiate career at Cornell last season before playing seven games at the end of the year with Worcester. Chances are he doesn’t make the squad out of training camp but he should play big minutes for the AHL Barracuda this season and, given an injury or two, he could certainly see himself called up to the NHL sometime this season. Drafted 27th overall in the first round of the 2014 NHL Entry Draft, Goldobin is clearly the most highly skilled prospect the Sharks have. His defensive game, however, is still woefully underdeveloped, which does little to help the annoying Russian stereotype of poor two-way work ethic. Goldobin spent last season playing in Finland and by all accounts had a good year of development overall but still has a ways to go to fine tune his game. A naturally slender player, Goldobin has put on weight since last season but when he takes off his shoulder pads he still looks much thinner than this fellow prospects. Goldobin is also likely to start the year with the Barracuda and if he wants to get a crack in the NHL this season, he best put up big offensive numbers without being a defensive liability. 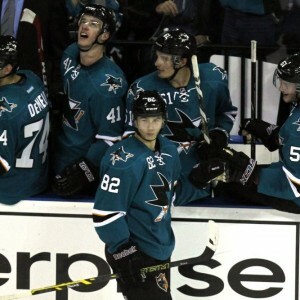 Drafted in the fourth round in 2010 by the Florida Panthers, Joonas Donskoi never signed an NHL contract until becoming a member of the Sharks organization this past May. All one really needs to know about Donskoi is that he was the MVP of the 2015 playoffs in the SM-liiga, the top professional league in Finland. At 23-years old, Donskoi is a mature two-way player that at this very moment is fully capable of holding his own in the NHL. He still needs a strong showing at camp, though, and some luck on his side to make the roster. Unlike what some media believe, Barclay Goodrow showed a lot of good things last season for a fourth-line player. He can skate, kill penalties and is a physical force on the ice with good size (6 feet 2 inches, 215 pounds). 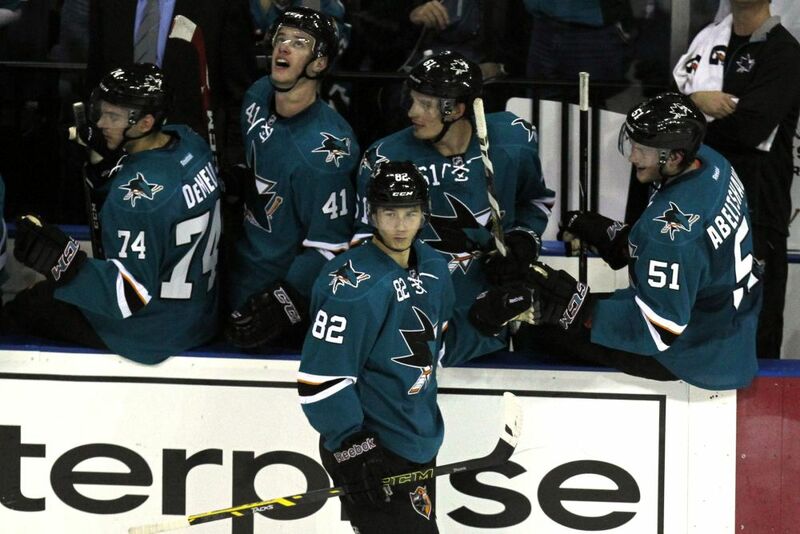 Donskoi is significantly smaller at just 6 feet, 190 pounds. Considering Donskoi is also transitioning to the smaller North American ice, it seems smart to let him start with the Barracuda. He projects more as a top-nine player than a fourth liner and right now the Sharks don’t have a desperate need for more scoring talent up front. That said, given an injury to the top nine, Donskoi will likely have the edge over Goldobin and Jevpalovs for the first call-up. Veteran AHL defenseman Dylan Demelo was briefly called up to the NHL last season but never played. Drafted in the sixth round back in 2011, it has been a long road to the show for the Ontario native. A veteran of 137 AHL games with Worcester, the 22-year old is actually a likely bet to make the roster out of training camp. If the Sharks do the smart thing and let youngster Mirco Mueller develop in the AHL with the Barracuda to start the year, the sixth and seventh defensemen on the roster will be Matt Tennyson and Demelo. The latter even has a shot to play on a regular basis ahead of Tennyson as the sixth defenseman. On the first day of training camp, it was Demelo paired with Brenden Dillon and Tennyson was with Mueller. This could be a sign that Demelo is starting with an edge over Tennyson for playing time. While Tennyson actually has some NHL experience, and would be my choice to play regularly instead of Demelo, the organization seems to be higher on Demelo. So whether it is as a seventh or sixth defenseman, the right-hander with a booming shot is by far the closest Sharks prospect to making his NHL debut.